Most homeowners understand that upgrading insulation levels is a surefire way to cut the cost of heating and cooling. But what many people don’t realize is that sealing air leaks is just as important as adding insulation to improve home energy performance. "Fluffy" insulation like cellulose and fiberglass can’t stop air movement, but spray foam insulation can. 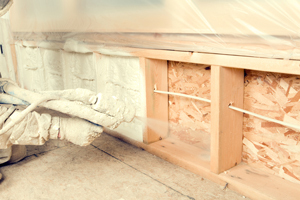 With spray foam insulation, you can seal air leaks and add insulation in a single step. The R-value of standard 2-part, closed-cell spray foam is high –at least R-6 per in. During the application process, spray foam turns from a liquid into a foam that expands rapidly and sticks to all the materials it contacts. Then, in just a minute or two, the foam hardens into a thick, stable, insulating coating that won’t shift, settle or compress over time. Spray foam costs more than other types of insulation, but its superior sealing and insulating qualities make it a smart choice in many applications. 2-part spray foam is different than the single-component (1-part) foam that’s sold in pressurized cans at hardware stores and home centers. The "2-part" designation means that the foam is created by combining two liquid compounds right at the application nozzle. The resulting chemical reaction turns the liquid into rapidly expanding foam, while also generating heat. Specialized equipment and protective gear are required when applying 2-part foam because potentially harmful outgassing takes place during and after the application process. If you’re hiring an insulation contractor to do a large-scale application of 2-part spray foam, make sure the contractor has a significant amount of experience with this insulating technique. It’s usually necessary for a home’s inhabitants to be out of the house when a large-scale application (such as an entire attic or home addition) is happening.